After Jesus Acedo, the legendary guitarist and leader of Tucson, Arizona based psych rock band Black Sun Ensemble, died in 2013 the band didn't want to just stop playing but couldn't carry on as BSE either. 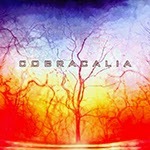 So they changed their name into Cobracalia after a track on the first BSE album, and continued honoring the music and visions of Acedo in their own, fresh way. I'm glad they did, since this is a marvelous album. First we get the Eastern tingled, rhythmical "Dandyloin" that sounds pretty much like the latter day BSE with its percussion and odd melodies and solo guitar work. Nice! "Fistful of Flowers" also includes vocals and even a chorus but the mystical vibe is quite similar to the opener. I love the violin on this one. "Arabic Satori" is at first a bit more laid-back, but gets intense and heavy in the middle sounding sort of like King Crimson. "Mandala" is a groovy and percussive track reminding some of the old BSE stuff and I like it a lot. The shortest piece is "Wrong Again" at 2:32 and it has weird, whispered vocals and an almost jazzy mood with some sax. The atmospheric and melancholic "Queen of the Night" is one of the best pieces in my opinion. The going gets wilder towards the end... "Total Internal Reflection" is a mellow keyboard-driven thing, and electronic/acoustic percussion are added later on as well as some electric guitar etc. "Egyptian Magician" is one of the highlights and has a magical, ethnic vibe with all the oud, percussion etc. but there's also some heavy guitar. "Simpatico" has a slow, dub-like beat and some electronic effects. "Lotus" has a more acoustic vibe and sounds just wonderful and refreshing. "Tijuana Mama" is a beautiful, soulful and mellow piece, and the longest track on the album called "Gas Giant" is a majestic, melancholic and beautiful tribute to Jesus Acedo bringing to mind "The Golden Void" by Hawkwind. Amazing ending for a great album! Be sure to check out this CD.